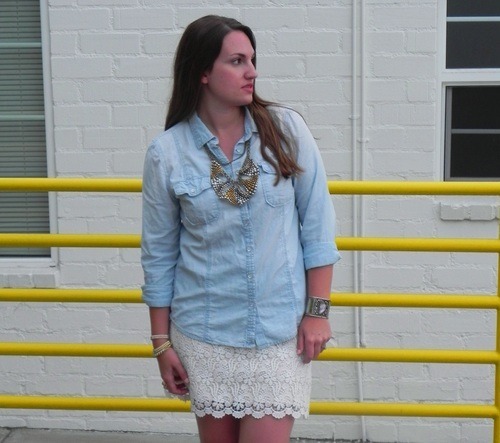 Now onto this little denim and lace ensemble. I’m a true believer that every woman needs that go-to accessory that can punch up a look – no matter how basic or casual. In guy terms, it’s typically a watch referred to as “the heavy-hitter” – for me, it’s my Pam Hiran beaded necklace. Mind you, I spotted it at Anthropologie months ago – but like many women before me, I waited for it to go on sale. Needless to say I obsessed over it in the coming weeks (naturally because I couldn’t find it at any Anthropologie within a 10 mile radius – believe me, I looked), and it wasn’t until I put my keen online shopping skills to good use, that I managed to snag what seemed to be the last living one on earth! So bear with me if it makes an appearance in more than one post – a girl’s got the right to flaunt, right? 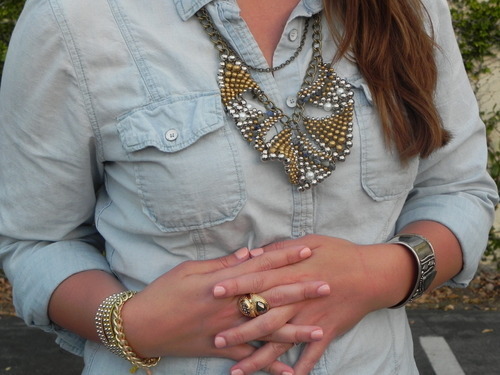 Denim Shirt: The Gap (Madewell’s ex-boyfriend shirt is identical). 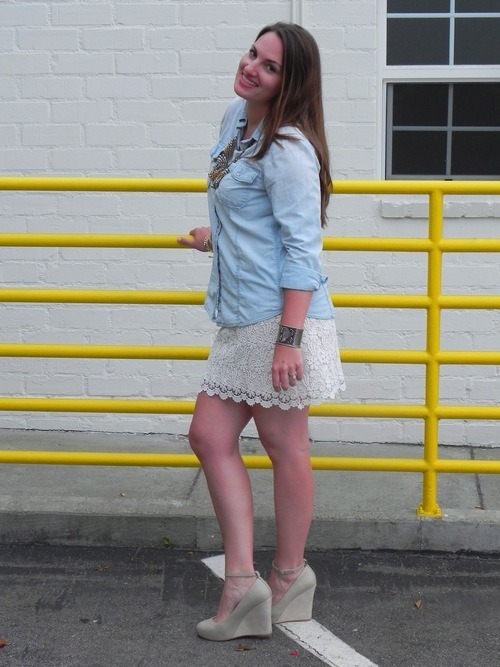 Lace Mini Skirt: Zara. Platform Shoes: Jeffrey Campbell (Urban Outfitters carries these and these). Necklace: Pam Hiran (feast your eyes on these Anthropologie statement necklaces). Nail Polish: Essie A Crewed Interest. Hawaiian Abalone Shell Cuff: Gift from my grandma. Friendship Bracelets: Target. Gold Ring & Chain Bracelet: So Good Jewelry in San Diego.